"VERY PRIVATE WITH ALMOST 1 ACRE OF LAND"
Hill top Villa with Panoramic views! 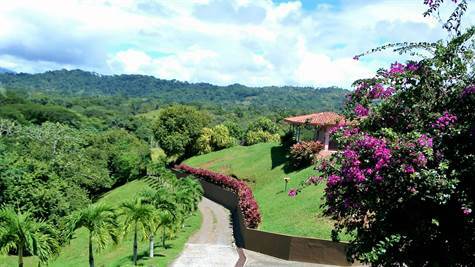 Located near the quaint little town of Esterillos Oeste which is tranquil and abounds with nature and beautiful beaches. The beach is stunning, full of palm trees where all t so when look out on the distance it seems like you're the only one there, it's a great view. But there's an even better view, and it's from the top of this gorgeous house, where you can admire the ocean and the mountains at the same time. This 2600 sq. ft. home has 3 bedrooms and 2 baths, kitchen with custom wooden cabinetry and private access road with an electric gate. To keep things fresh the teak ceilings rise high throughout the house, the floors are ceramic tiles. Amenities include a beautiful large swimming pool and outdoor entertaining area surrounded by exotic plants, and outstanding ocean views. The rooms are spacious and the bathrooms very well decorated, all of it built to US standards. Large 2 car garage with electric garage door, a laundry room and a bodega for easy storage. This is a great location and a fantastic house.